What actually is depression ? According to the official website of Mayo Clinic,depression is a mood disorder that causes a persistent feeling of sadness and loss of interest. 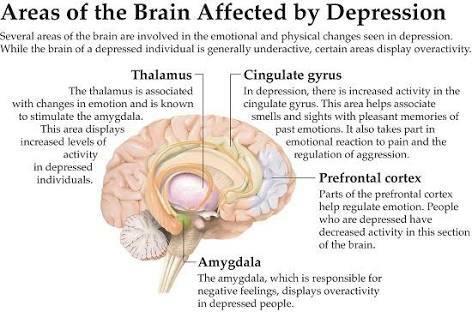 Also called major depressive disorder or clinical depression, it affects how you feel, think and behave and can lead to a variety of emotional and physical problems. You may hear your doctor call thinks “major depressive disorder.” You might have this type if you feel depressed most of the time for most days of the week. If you have depression that lasts for 2 years or longer, it’s called persistent depressive disorder. This term is used to describe two conditions previously known as dysthymia (low-grade persistent depression) and chronic major depression. Seasonal affective disorder is a period of major depression that most often happens during the winter months, when the days grow short and you get less and less sunlight. It typically goes away in the spring and summer. Bipolar disorder used to be known as ‘manic depression’ because the person experiences periods of depression and periods of mania, with periods of normal mood in between. This is not just a fleeting experience. Sometimes the person loses touch with reality and has episodes of psychosis. Experiencing psychosis involves hallucinations (seeing or hearing something that is not there) or having delusions (e.g. the person believing he or she has superpowers). Bipolar disorder seems to be most closely linked to family history. Stress and conflict can trigger episodes for people with this condition and it’s not uncommon for bipolar disorder to be misdiagnosed as depression, alcohol or drug abuse, attention deficit hyperactivity disorder (ADHD) or schizophrenia. Women with PMDD have depression and other symptoms at the start of their period. Women who have major depression in the weeks and months after childbirth may have peripartum depression. Antidepressant drugs can help similarly to treating major depression that is unrelated to childbirth. Psychotherapy can often help you get through a period of depression that’s related to a stressful situation. This type is different than the persistent sadness of typical depression. It is considered to be a “specifier” that describes a pattern of depressive symptoms. If you have atypical depression, a positive event can temporarily improve your mood. Abuse :Past physical, sexual, or emotional abuse can increase the vulnerability to clinical depression later in life. Certain medications: Some drugs, such as isotretinoin (used to treat acne), the antiviral drug interferon-alpha, and corticosteroids, can increase your risk of depression. Conflict :Depression in someone who has the biological vulnerability to develop depression may result from personal conflicts or disputes with family members or friends. Genetics :A family history of depression may increase the risk. It’s thought that depression is a complex trait, meaning that there are probably many different genes that each exert small effects, rather than a single gene that contributes to disease risk. The genetics of depression, like most psychiatric disorders, are not as simple or straightforward as in purely genetic diseases such as Huntington’s chorea or cystic fibrosis. Major events :Even good events such as starting a new job, graduating, or getting married can lead to depression. So can moving, losing a job or income, getting divorced, or retiring. However, the syndrome of clinical depression is never just a “normal” response to stressful life events. Other personal problems:Problems such as social isolation due to other mental illnesses or being cast out of a family or social group can contribute to the risk of developing clinical depression. Selective Serotonin Reuptake Inhibitors(SSRIs) :Increases avaibility of serotin. Ticyclics(TCAs) : Increases the levels of serotonin and norepinephrine. Cognitive Behavioural Therapy(CBT) : Targeted at changing negative, self defeating thought patterns and behaviours. Interpersonal Therapy(IPT) and Group Psychotherapy :Focuses on interpersonal relationships and improving communication skills and social support. Psychodynamic Therapy :Focuses on resolving the patients conflicted feelings and making characterological changes. Mood Stabilisers: Patients with Bipolar disorder are at a risk of switching into hypomania(mild to moderate mania) to severe mania when taking antidepressants. For this reason, mood stabilisers are usually prescribed alone or in combination with antidepressants for treatement of bipolar disorder. Herbal Therapy: Herbal products may have benificial effect in mild cases of depression. Patients should talk with their doctor before taking any herbal or dietary supplement. Studies are going on to determine the effectiveness of these remedies. Exercise : Exercises may be useful in mild cases of depression. Increased physical activity helps by boosting serotonin levels in the body. Lfestyle changes are essential in the treatement of depression. Regular exercise can be as effective as medication. Eating well is important for both physical and mental health. Sleep deprivation aggravates Irritability, moodiness and fatique. So getting enough sleep each night is important. Strong social networks(not online ones) prevents isolation, a key risk factor for depression. This is an excellent, easy to understand description of this debilitating mood disorder. Brilliantly written!! Thanks for this and thanks for the follow!! I checked it out! Good blog and good read. Looking forward to more.